Our body is burning calories at all times,even while we watch tv or walk or eve we sleep or eat.Whether we are listening music or reading, we are burning calorie. So if you want to reduce weight you have to active MORE then you can burn MORE calories. 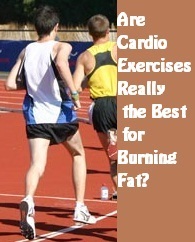 Our body uses more carbs than fats durings hard exercise. Riding cycle for half an hour or running for 1-2 miles will burn more fats.So this type of activties are cardiovascular in nature and if you can maintain this type of activities for 30 minutes to 1 hour then you can lose body fat. Interval training means discontinuous of physical training or exercise or cardiovascular workout (jogging,cycling,swimmming) .Intervals contribute to lose weight.It make you fitter,which allow you to work out harder and more calories.But remember one thing that you have to burn more calories than you consume to reduce fat even with intervals. If weight have not reduced by doing same type of cardio workout for weeks or months then you have to consider by mixing up the activity.For eg. if you are jogging for half an hour per day,you might try walking for fifteen minutesand then resuming you jogging speed.This is reffered to as interval training to burn fat.Really this training will boost your cardio workout.